Two years ago, I posted a recipe for Skillet Lasagna, and it's still one of the most popular recipes on this here blog. And for good reason: it's super easy, fast, and amazingly delicious. Since the first time I made it, I've been mulling over other variations, one of which being a skillet lasagna that features the beautiful produce of summer. But lo and behold, good old America's Test Kitchen pulled through and provided me with just that! 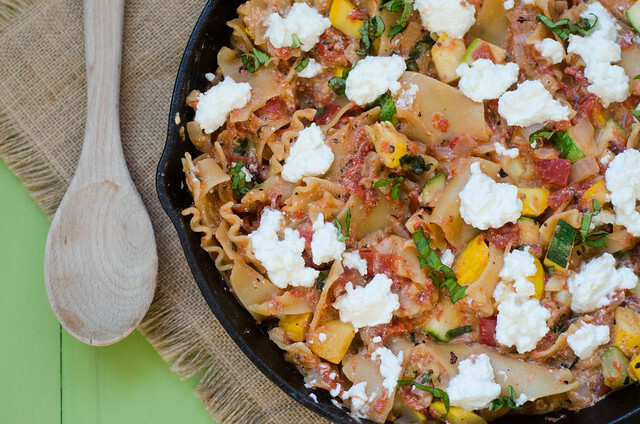 This skillet lasagna features tomatoes, zucchini, and squash. It is just as low-maintenace as the original, if not more so. It's also super delicious, and was a hit with everyone in my family - if that's not a ringing endorsement, I don't know what is! Everything cooks in one skillet, so this is really as easy as it gets. Minimum work, maximum reward. What more do you want? Lazy summer days turn into lazy summer dinners here, and I couldn't be happier about it! Heat the oil over medium-high heat in a 12-inch nonstick skillet. Add the onion and cook until softened, about 3 to 4 minutes. Stir in the garlic and red pepper flakes and cook until fragrant, about 1 minute. Drain the can of tomatoes into a 2-cup liquid measuring cup. Add enough water to the reserved tomato juice to equal 2 cups. Pour the tomato-water mixture over the onions, then stir in 1 teaspoon of salt and 1/2 teaspoon of pepper. Scatter the noodles over the the top, then layer the tomatoes over the noodles. Bring to a simmer, stir, and reduce heat to medium. Cover the pan and cook about 10 minutes, stirring occasionally. Stir in the zucchini and squash, and cook for 8 more minutes, or until the noodles and squash are tender. Add the basil and 1/2 cup of the ricotta. Stir until the sauce is creamy, season to taste with additional salt and pepper, remove from heat, and dollop the remaining 1/2 cup of ricotta over the top. Allow to cool 5 to 10 minutes, and serve. This is making me with that I had some of this lasagna for breakfast ;) It looks so, so good!! 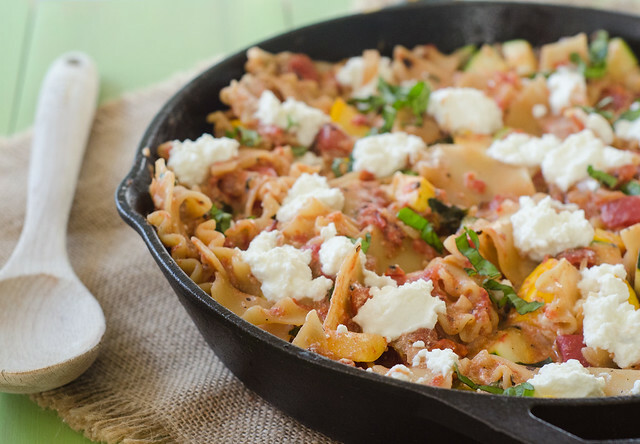 Skillet lasagna stuffed with ALL THE VEGGIES sounds like the perfect summer comfort food! Love that it doesn't require turning on an oven!